Las Vegas, NV: Two suspects went on a “revolution” rampage in Las Vegas today. 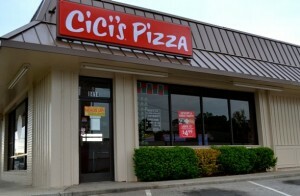 Details are still emerging but a man and woman walked into a Cici’s pizza (ignoring the no guns sign) and shot two Metro PD officers who were having lunch. The female shot officer Soldo in the back of his head while he was refilling his soda. His partner, Officer Beck was shot multiple times as he tried to draw his pistol. He was later pronounced dead at a local trauma center. After shooting the two officers the murders stripped the officers of their weapons and shouted “This is the start of the revolution!” before leaving the pizzeria. The two murders walked to the nearby Walmart where they opened fire killing a woman inside the store. A quick thinking shopper was carrying a concealed handgun in the Walmart and exchanged gunfire with the pair of murders, injuring at least one. 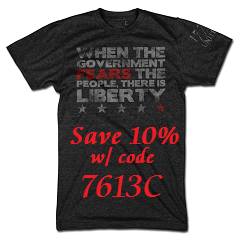 Tragically it appears the armed civilian may have died from injuries sustained in the gunfight. 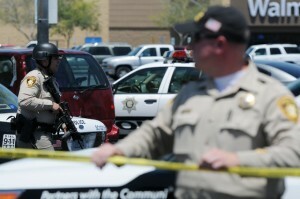 The pair of of murderers then retreated outside of the Walmart and killed themselves. Details are still emerging and Metro PD isn’t taking the “revolution” threat lightly, they are doubling up officers just in case of copy cats.